The Arizona Fall League has long been a place for the top MLB prospects to climb the ladder of success to a big league park. Now, more people may see those bright young stars, because of a former NFL quarterback. That is correct, former NFL quarterback and current Mets outfielder Tim Tebow will report to the Arizona Fall League on Sunday and play for Scottsdale Scorpions, per a club announcement. “We want Tim to play in more games to continue developing his skills on the field while facing advanced competition,” said Mets general manager Sandy Alderson. 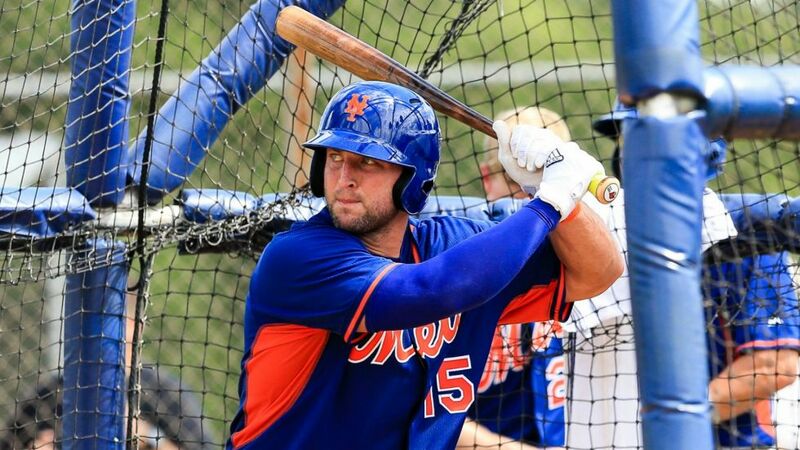 Tebow, the former Heisman Trophy-winning quarterback, signed a minor-league contract with the Mets in September and hit .286 (4-for-14) with one home run, two RBIs and two walks in three Instructional League games. The league ended Tuesday after Florida governor Rick Scott declared a state of emergency to prepare for Hurricane Matthew. 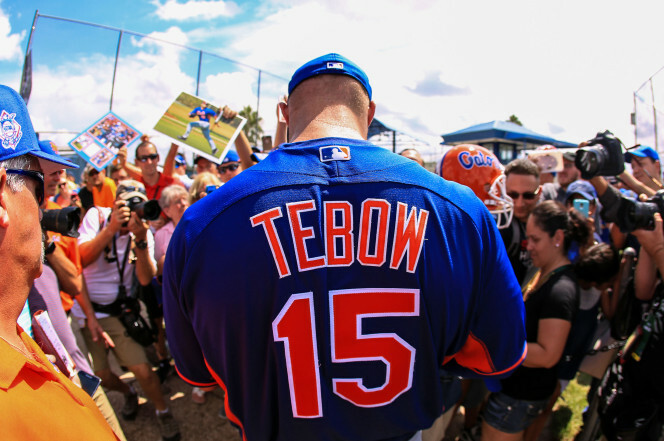 On September 8th, just over a week after he held a showcase for 28 of Major League Baseball’s 30 teams (neither the Cubs nor Athletics sent representatives to his workout), Tebow inked a minor league deal featuring a $100K signing bonus with the Mets. The 29-year-old, who previously hadn’t played baseball since high school, then began his pro career in the Florida Instructional League and hit .286/.375/.500 with a home run and two walks in three games. Tebow skipped Friday and Saturday workouts in the instructional league because of his college football broadcasting commitments with ESPN and the SEC Network, and the ex-Florida Gator will do the same in the AFL, according to Vince Lara-Cinisomo of Baeball America. In going to the AFL, the two-time national champion and 2007 Heisman Trophy winner will have a chance to further prove his worth as a baseball player against much better competition than he has faced to this point. Tebow will also play for the same AFL team basketball legend Michael Jordan suited up for during his brief foray into baseball. In my opinion, Tim Tebow is another great reason to enjoy the Arizona Fall League. I have been to several games, and I love the interaction with the players of this league. The access, and interaction with the players is like nothing I have ever experienced on a baseball diamond. But, those things will surely be effected by the attention Tebow will bring with him. Therefore. this season will be interesting to experience, and I plan to do it alot. Cleatgeeks.com will be covering the Arizona Fall League this season, and will be your home to tons of information regarding the AFL. What is great about this league, is that unlike spring training, every MLB team is represented by these 6 teams. We will bring you the inside news and player stats on the athletes who represent and may soon be wearing the jerseys of your favorite teams! 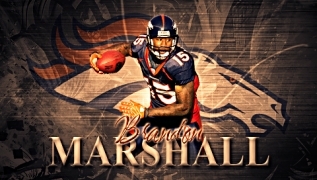 Broncos LB Brandon Marshall gets a new contract extension! This week, the Denver Broncos got a contract done for one of their key defensive players. No, it was’t Von Miller, don’t get your hopes up Broncos country. Luckily, it was for LB Brandon Marshall. Marshall signed a contract extension of 4 years/$32 million with $20 million guaranteed. I believe that is the perfect contract for both sides. Now, Broncos country has a chance to have a scary line backing corp through 2020, which could mean trouble for the rest of the NFL. Brandon Marshall was a fifth round pick by the Jacksonville Jaguars in 2012, never really getting a chance to show his full potential. He was a 2nd string linebacker at best in Jacksonville so they decided to release him. On September 13, 2013. Working hard to join the 53 man roster, he accomplished his goal in late 2013 after Von Miller was placed on IR. In 2014, he was able to start his first game for the Broncos in 2014 when Danny Trevathan suffered an injury. Ever since he got a taste of being a starter for the Denver Broncos, he’s never looked back. In 2014, Marshall 113 total tackles, including two sacks, 1 forced fumble and 1 interception. Losing to the Colts in 2014 made Marshall realize he had to step his game up, as so did everyone else. And that’s exactly what he did. He racked up 102 tackles, 1.5 sacks and 1 interception. Yes, his stats were better in 2014, but there is something the NFL doesn’t keep stats on, leadership. Marshall was a key component in Wade Phillips defense last year and will be going forward in the future. Marshall has proved over the last two seasons that he can and will lead the team when his number is called upon. He led the team in tackles in 2014, and finished 2nd in 2015. Marshall knows his assignment every week, and doesn’t disappoint on completing his assignment. I believe his contract was well-deserved. He went from a 2nd string linebacker in Jacksonville to a Superbowl champion in just 4 years. The contract talks will now move on to Emmanuel Sanders, who is looking for a extension as well. And, of course, Von Miller. Hopefully, miller gets a contract done as soon as possible. If it doesn’t, it could begin to take a strain on the reigning Superbowl champions, which is the last thing they need. But for now, Bronco country can focus on the signing of one of their defensive stars who hasn’t even hit his prime yet, so he can only get better. Last year the Arizona Diamondbacks made a trade with the New York Yankees. They traded veteran utility player Martin Prado for catcher Peter O’Brien. This is the classic case of why, in my opinion you trade away veteran players for young controllable prospects. Prado did do well in Yankee pinstripes for the 37 games in which he played for them. His batting average was .316 and he slugged .541 with a 145 OPS+. But again it was for 37 games because being sidelined by an appendectomy. O’Brien will likely start the season in the minors this year, but is putting himself on the Diamondback top prospect list with the power he has shown in the Arizona Fall League and so far in Spring Training where he is wearing number 72. In 277 minor league games O’Brien has a career average of .267 while slugging .434 with an On-base plus slugging percentage of .853. And he is controllable for the next several seasons. Martin Prado, by the way, is not even with the Yankees anymore. He was subsequently traded to the Miami Marlins for Nathan Eovaldi on December 25th. Then Yankees prospect Peter O’Brien taking batting practice while playing for Team USA. I personally was able to see him in the Arizona Fall League this past season, and was equally impressed. I witnessed him hit his fair share of moon shots over the fence. While playing for the Salt River Rafters he hit 5 home runs with 44 total bases, which were both tops on his team while batting a respectful .256. They definitely traded someone in the twilight of his career for someone with a bright future. Tuesday November 4th the annual Rawlings Gold Gloves were handed out in both the American and National League. And to the surprise of no one Dustin Pedroia received his 4th Gold Glove after making only 2 errors in 133 starts in 2014. As if that was not good enough he is also being inducted in the Arizona Fall League Hall of Fame a day later in Scottsdale Arizona. He will be inducted as part of pre-game festivities that will begin at 6:00 pm where he will receive a Cooperstown style plaque and a gift from the Boston Red Sox. Pedroia will have his number retired from the Scottsdale Scorpions of the AFL before they play the Salt River Rafters at 6:35 pm. Tickets will be available at the Scottsdale Stadium box office beginning one hour before game time. Tickets are $8.00 for adults; $ 6.00 for senior citizens and youth (17 and under). For additional information, call 480-990-1005. Cleatgeeks.com will be live at the game and will have a report and several pictures from the game. Do you recognize the guy in the picture above? Yes, that is an old picture of 12 year MLB veteran Delino Deshields. And he will lead the charge as the manager of the Surprise Saguaros this season in the Arizona Fall League. But, if you add all the years of MLB experience by the coaches in this years Arizona Fall League, it would be a whopping 107 years! Besides former infielder Delino Deshields, 8 time All-Star Lance Parrish will bring his 18 years of playing knowledge as he manages another AFL team. If that was not enough for you how about another player as a manager with an impressive career as a MLB infielder in Mike Mordecai. Former 7 year veteran MLB catcher Vance Wilson will also manage a team in the AFL. And the final 2 managerial spots are occupied by Andy Haines, and Jeff Banister. Along with the managers all six teams also announced their hitting and pitching coaches. Lance Parrish will have the Brewer’s Chris Hook be his pitching coach and Alan Mills from the Orioles for his hitting coach as well as Andy Tomberlin from the White Sox. Deshields will have two-time All Star Jody Davis as his hitting coach. He also will have two pitching coaches, Jeff Andrews from the Rangers and Andrew Lorraine from Seattle. Mordecai’s hitting coach will be Jeff Sparks of the Oakland organization with two hitting coaches inRon Villone and Matt Wise. For Wilson his pitching coaches will be R.C. Lichtenstein and Jason Simontacchi and Gary Ingram as hitting coach. Haines’ team will feature Josh Miller of the Astros as pitching coach and Kevin Riggs will be the hitting coach from the Rockies organization. Finally, the team managed by Bannister will have two pitching coaches, Ray Burris and Mike Couchee and one hitting coach, P.J. Pilittre. The Arizona Fall League will kick-off on Saturday October 4th with the Bowman Hitting Challenge with opening day on Tuesday October 7th. The 2014 season will conclude on Saturday November 15th with the Championship game. Keep checking back at baseballbabble.com for further information about the Arizona Fall League. The 2014 Arizona Fall League season will, as always, feature some of the best up and coming minor league superstars and will feature two divisions of three teams each for 32 games with 4 special events sprinkled into the season for your baseball entertainment. Salt River Fields 1 of 5 stadiums to host the 2014 AFL. The East Division will feature the Mesa Solar Sox who will play their home games at the newest spring training site, Cubs Park (pictured above). Featuring the stars of the Chicago Cubs, Los Angeles Angels of Anaheim, Oakland Athletics, Toronto Blue Jays and Washington Nationals. The Salt River Rafters will also be in the East Division and play home games at Salt River Fields at Talking Stick and will be represented by players from the Arizona Diamondbacks, Colorado Rockies, Houston Astros, Miami Marlins, and Minnesota Twins. Lastly, the Scottsdale Scorpions will be the third team in the East Division and will be made up of players from the New York Mets, Philadelphia Phillies, New York Yankees, Pittsburg Pirates and San Francisco Giants and play their home games at Scottsdale Stadium. The West Division will also feature three teams with the first being the Glendale Desert Dogs. The Desert Dogs will feature players from the Chicago White Sox, Baltimore Orioles, Los Angeles Dodgers, Milwaukee Brewers and Detroit Tigers and play their home games at Camelback Ranch Glendale. Surprise Stadium will house the last two teams in the West Division. The Peoria Javelinas will have players from the Atlanta Braves, Kansas City Royals, Cleveland Indians, St. Louis Cardinals, and Tampa Bay Rays. The second team, the Surprise Saguaros will be constructed from players from the following teams Boston Red Sox, Texas Rangers, San Diego Padres, Seattle Mariners, and Cincinnati Reds. The six team Arizona Fall league was founded in 1992 and is operated by Major league Baseball. Most of the players who participate in the Arizona Fall League are from a particular clubs Double-A or Triple-A affiliates. These are the players who the clubs either consider to be on the cusp of the major leagues or they were hurt during a significant part of their minor league season. Each team can opt to send a maximum of 2 players below the Double-A level. As you have read from the above list each AFL team consists of 5 teams, each team provides 7 players, giving the AFL team a total of a 35 man roster.